During our vacation in Sweden we visited the Skansen Open Air museum and I studied the bakery with more than casual interest. The bakery was open for visits and the Swedish chef was working on pretzel shaped breads. I could almost here him singing a little Muppet song ("bork, bork, bork") and sure enough we bought some sweet breads to munch on. It was nice to see the equipment and the baker at work, and I willed him to turn around and ask me to join him, would have loved to get my hands on that dough, alas no chance. In the pic near the ceiling are proofing racks, ideal; warm air travels up and will help proof the dough! I know I would like some of those! I think the white device in the middle of the room is a kind of waffle iron or pizzelle maker to make these Swedish stacked cakes, with wafer thin printed layers. 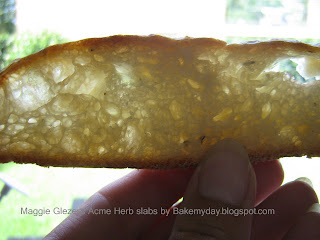 Once back home, the first bread I made was Maggie Glezer's Acme Herb slabs, a ciabatta style rosemary flavoured bread. My partner in crime -again- was Tanna, we baked almost simultaneously. The recipe can be found in Maggie Glezer's Artisan Baking as well as here, so I won't repeat it. I followed the recipe exactly and only prolonged the first fermentation a bit. (room temperature was quite cool). It's a bread made with a sponge which rests overnight on your counter. The amount of yeast you use in this is very very small (Glezer likes to keep the use of yeast to an absolute minimum and I like her for that!). The proofing of both sponge and dough gives this bread extra depth and flavour with little effort. I must say that the method reminded me a lot of the famous Royal Crown Tortano which Lindy baked here, and I baked here and others following suit here and here. That bread got rave reviews and I still use a picture of it as my "icon picture". The initial dough is very smooth, silky and almost too soft to handle. I added chopped fresh rosemary, a small hand full needles. Like the tortano, you are supposed to turn the dough in it's bowl in 20-minute intervals during the first 60 minutes of fermenting. This first fermenting takes 5 hours! Now, don't let that scare you, you don't have to sing lullaby's, you can just leave it be after the first 60 minutes. The award is in the eating. 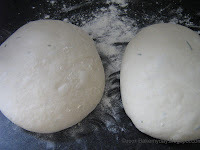 After balling the dough it get's another rest in a couche and then you'll proceed by the standard, ciabatta method of pressing in a rectangle and dimple the bread with your fingers. Covered it will get another rest (yes this is a third one) untill it gets very soft and well expanded. About two hours. We're now at a total of 8 hours..... Remember it's still worth it!! 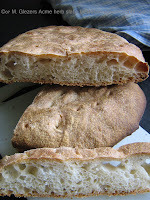 Plan to make this bread on a day you'll be in and out of your house, (I did some major shopping during the first rise) it is a very friendly dough, it won't scream at you when you leave it alone for a while. The instructions for baking were very cruel though! We were asked to poke the risen breads with a skewer all the way through and flip the breads once they had been in the oven for 5 minutes. That, my dear fellow bakers, hurts! They were getting some nice ovenspring and usually I'm very happy to see that, but now... I had to brutally flip them over, right on their domed uppers. Ouch! This was turning into a major brick like bread disaster..... But NO! NO! It was so good, in fact it was so very good that we were dipping and munching our way through two entire breads in one sitting. During the afternoon. Dipped in lemon olive oil and Crema di Balsamico. 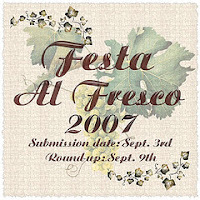 So I'll guess I'll have to make it again and guard it with my life to bring to the annual Festa al Fresco end of summer party Lis and Ivonne are hosting on September 9th! (So very nice of them to host a party for my birthday! They promised to do the dishes as well). To make sure there will be enough bread to share, Tanna will bring hers as well. 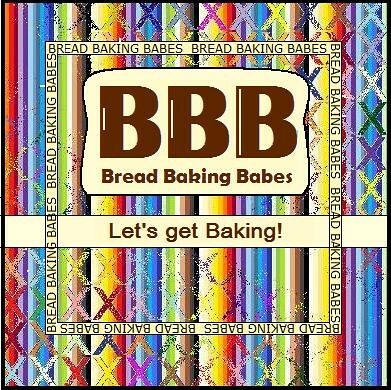 You are a bread baker extraordinaire! That bread is gorgeous and I'd buy it in a heartbeat. I have Maggie's book but have yet to try it. Maybe you've finally inspired me to give it a go. I'll preheat the oven so that when you get to the party, you can pop your bread right in. As always, thanks so much for coming, my friend! P.S. I must go to Sweden one of these days! Thanks so much for joining in on the fun! I think I got mine to the party on time with you!! I love the proofing racks near the ceiling! My sister in law has a clothes drying rack that raises and lowers on a pully, but a proofing rack would be cool, well in this case it would be warm. That is a really great bakery!! This bread sounds great, I read Tanna's posts on it too. Love the reference to the muppets too. Made me smile! Also I've meant to say several times. I love it that you're so honest about being a SAHM and the feelings that can bring up. Look at that crumb on that bread! I could just have me some with balsamic and a great olive oil right now! Interesting view of that bake shop. You just reminded me, I need to get cracking on my sour dough starter that I was suppose to have done last winter! Love the crumb of your bread. But why all this torture to the bread!At least it was good. You will find siiting next to it at the party. wat leuk om in een andere bakkerij te kijken hè! dat met die buizen is een goede vinding,handige jongens die zweden!! geniet maar van je al fresco party en gefeliciteerd!! This is one of my very favorite breads to make, and eat. It was the first one I made from that book..which I love...and I always go back to it. Yours looks wonderful. And it's the best for making bruscetta- already a perfect shape.